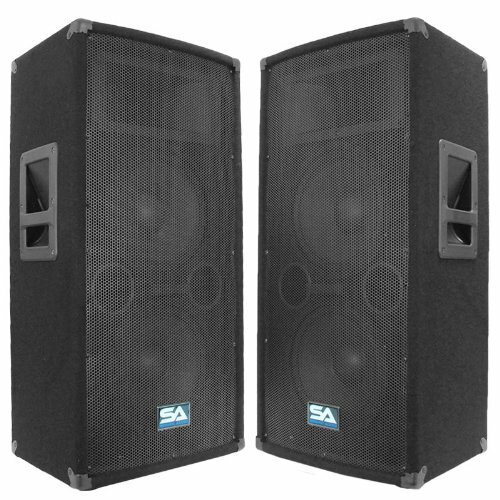 Pair of Dual 10" Professional Speaker Mains - Model # SA-100T (set of 2), Woofer - 2 10" & each has a 40 oz. magnet w/ 2" caption voice coil, 300 Watts RMS - 600 Watts Peak, Wired at 4 ohms, 45Hz - 20KHz, Sensitivity: 97 db. , Tweeter: 6x12 Titanium horn driver, Crossover: 12/18db per octave 2 way, 5/8 plywood front panel, Black carpet with black metal corners, Recessed handles, Metal Pole Mount on bottom for Speaker Stands, Full Metal Grill, Input terminal with two 1/4" & two speak on inputs, Can be Daisy Chained, Dual ports, 31.5" tall - 15.5" wide - 12" deep, Weight: 59 lbs per cabinet, These speakers are brand new., One year warranty. This listing is for a pair of these dual 10" speaker cabinets. You will receive two identical speaker cabinets, pictured and described above. Each speaker cabinet has the specs above. These are best for DJ's, Mains, PA use, keyboards, vocals, studio monitors. These speakers are great for vocals, PA systems, DJ gigs, keyboards, weddings and churches, and sound & studio monitors. Great for a full PA system. These are light weight and easy to carry.